Logic Oral Hygiene Gel There are 2 products. Logic dental hygiene gel helps prevent the formation of dental plaque and fights bad breath. Logic Oral Hygiene Gel is based on a multi-enzyme patented system and supplements your pet's own defence mechanism to help fight harmful bacteria in the mouth. Brushing the teeth is known to be the most effective means of removing plaque but this is not always possible. The multi enzyme complex in this gel works on the plaque helping to destroy existing plaque and prevent the formation of new plaque. The gel also contains a mild abrasive, whilst the gel itself boosts the action of saliva. This is a gel that can be applied directly into your pet's mouth. If your pet is very difficult it can be put on the pet's foot and then it will be licked off. Logic dental hygiene gel has a strong cleansing action in the mouth when the pet swirls it around with its tongue. 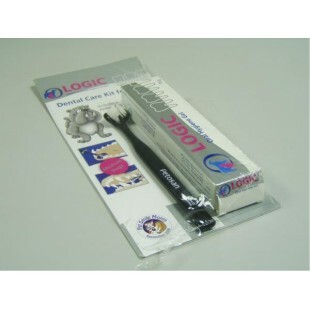 Logic oral gel comes with a handy extended neck applicator to prevent the need to put your fingers in the pets mouth.